We need you to send us your own local news stories and details of your local NF activities, including photos and links for publication here at the East Midlands National Front web site. We need to reach as many people as possible, and one of the ways we can do this is by drawing them to this website by offering them the information they seek, information supressed by the main stream media. By doing so we can help our region and thereby the party grow in strength. We can all contribute. You are the eyes and ears of the movement. 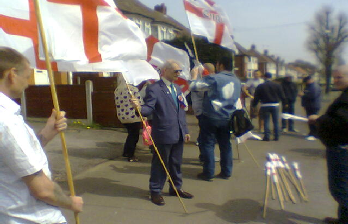 A hot sunny day on Saturday April 24th saw over 70 National Front members with activists and supporters totalling over 150 people take to the streets of Kingstanding to celebrate St Georges day to the applause and cheers of the locals and a fanfare of horns from passing motorists. 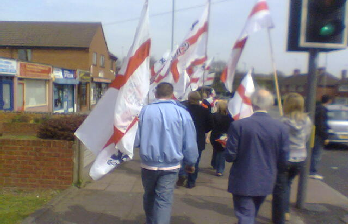 The event saw members and activists from all over England. from as far afield as Devon and Yorkshire, Worcestershire and Newcastle assembled for the event and to commemorate the life of activist Jason Spence who was murdered in the Kingstanding area of Birmingham. West Midlands police made the decision to allow the NF to steward the event ourselves and, for the entire two and a half mile route, the only police presence was three officers in an unmarked vehicle at a discrete distance. 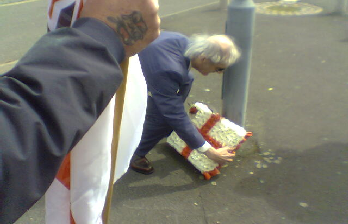 A wreath was laid at the spot at which Jason was killed and a respectful silence observed, after which the march continued on its way back towards the starting point. Local candidate Keith Axon said a few words about our struggle during a short rally. No opposition to the NF presence was encountered during the day and there was a very encouraging response from local people. Car drivers honked their horns in support and residents of all ages came out of their houses to applaud the National Front march and wave flags. 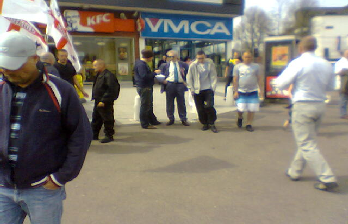 After the march, NF members handed out leaflets for forty minutes or so with no opposition. Once the day’s political events had been concluded, the marchers retired to a local pub. The Inspector in charge of policing the event came in and congratulated them on their good behaviour and effective organisation which had ensured a smooth-running and trouble-free afternoon. Thanks must go to all those who helped to make the day a success, in particular NF West Midlands Regional Organiser Tich, who arranged the march with the police, and North East organiser Biggsy, who was responsible for stewarding it. We hope that the positive reaction from Kingstanding residents is reflected in support for Tich who is standing for both Parliament and the Birmingham City Council in the area on May 6th and Keith Axon who is also standing for the City Council.